HMG Early Intervention provides family-centered services for infants and toddlers to age three with a developmental delay, disability, or a medical condition likely to result in a delay or disability. HMG Home Visiting provides first time expectant or new parents the information and support they need to be prepared for the birth of their child and provides ongoing education and support for families to maximize their child's health and development to age three. Both programs are available in all 88 Ohio counties. When you contact Ohio Help Me Grow in your community, someone will help you find the best program for you and your family. Anyone can refer a child or family to Help Me Grow! "Every child is unique. But when a child is diagnosed with a disability or does not meet milestones like crawling, walking, or talking when they should, a little help can make all the difference. The caring professionals from Help Me Grow and Early Intervention will come to your home and provide free support for qualified children to help them catch up with their peers. If you have concerns about your child's development, call your local Help Me Grow." 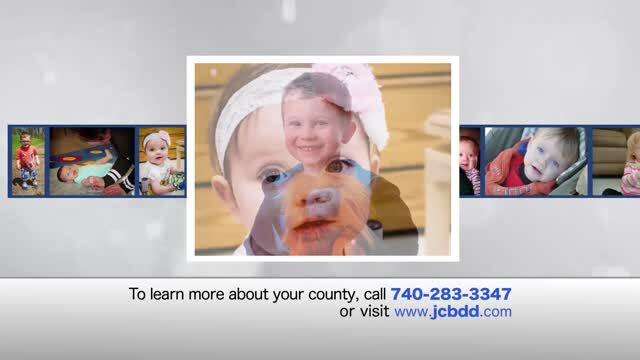 "This message brought to you by the Jefferson County Board of Developmental Disabilities." Do you have a concern about your child's development? HMG Early Intervention service needs are determined by a multidisciplinary team who evaluates and/or assesses the child's developmental needs. The team is led by a Service Coordinator who will work to assist and enable a child with a delay or disability and the child's family to receive services and rights as afforded under the Individuals with Disabilities Education Act. Children and their families will transition when they complete needed services or when the child turns age three, with supports to move on to the next phase of growth and development. The HMG Home Visiting Program works with and supports families and helps them set and reach their goals. In-home services include parenting education, ongoing screenings, coordination and referrals for community resources, and transition at age three. Hospitals, Pre and Post Natal Clinics, Physicians, Child care programs and early learning programs, Local Education Agencies and schools, Public health facilities, Other public health or social service agencies, Clinics and Health care providers, Public agencies and staff in the child welfare system, including Child protective service and foster care, Homeless family shelters, domestic violence shelters and agencies, and many more! Primary referral sources must refer children who have been the victim of substantiated abuse or neglect or a child who has been directly affected by illegal substance abuse and/or withdrawal symptoms resulting from prenatal drug exposure. What Information Will I Need to Make a Referral? Online: Visit www.helpmegrow.ohio.gov and click on the "Referral" tab. The parent will be contacted to ask about their interest in the voluntary programs. Nothing will occur without the family providing consent for participation. With parent consent, HMG will provide any professional referral source a follow-up communication.